This week, we started our lesson by talking about rules. We all agreed that, at times, rules are annoying because we can’t do what we want, but, they help to keep us and others safe. We went through our Sunday School rules and talked about how each one keeps us or others safe and what the natural consequences would be if we broke a specific rule as well as the punishment that might be dished out by teachers if one continues to break the rules. 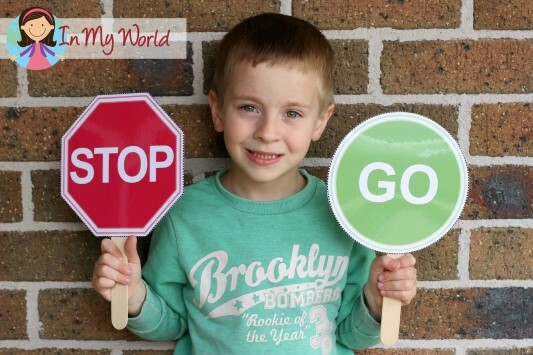 We didn’t get to play our “Obey the Signs” game as we left it until the end of the lesson and ran out of time! (Note for next year: play a short game at the START of lesson!) However, it is a fantastic game for helping kiddos to understand the importance of obeying rules. Once the game is finished, ask the children some questions, such as: How can you tell who wins? Quite evidently, the person who followed the rules AND got to the teacher first. What are the consequences of not playing by the rules? Going back to the starting point and possibly giving up your chances of winning! We then talked about the man God had created – Adam. 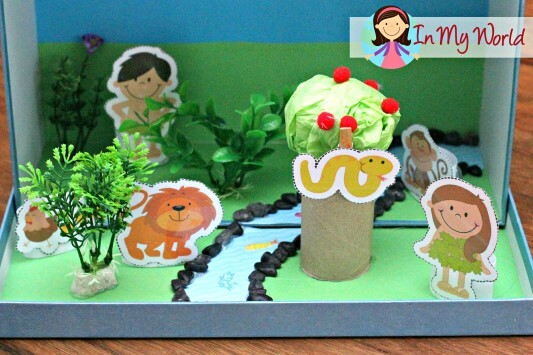 God made a beautiful garden for Adam called Eden and his job was to look after the plants and animals. However, Adam felt lonely because he didn’t have a friend. So God, made a woman and Adam named her Eve! She was the perfect friend for Adam. They both lived in the beautiful garden and were very happy. God told them to eat the fruit from any tree in the garden EXCEPT the one that was in the middle of the garden. God gave them a rule. 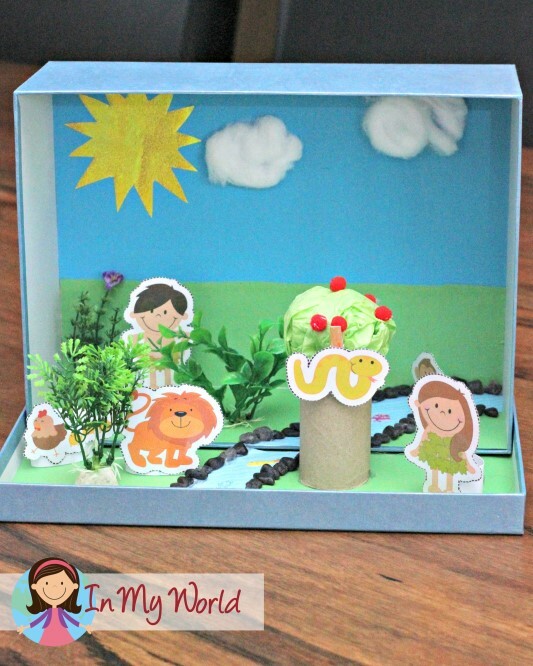 To help with the retelling of what happened in the garden, I made a a story box. The clip art I used is available for purchase from Kari Bolt’s store. I asked my kiddos what they thought: would Adam and Eve listen to God’s rule? I guess they must all be familiar with this Bible Story because they all thought that they would NOT listen to God’s rule. I continued to tell them the rest of the story. Once finished, we all agreed that the ending was very sad. We talked about the natural consequence of Adam and Eve’s sin – that they began to age – and the punishment handed out by God – that they were no longer allowed in the garden. How sad that they could no longer talk to God like they used to! Of course, I didn’t want to leave my kiddos feeling sad about what had happened to Adam and Eve, so I told them about God’s plan to help them and all the other people that had been born after them by sending His Son, Jesus, to earth. We made an Eve puppet to help us remember all that we had learnt about this week. And then handed out a take-home page for everyone. 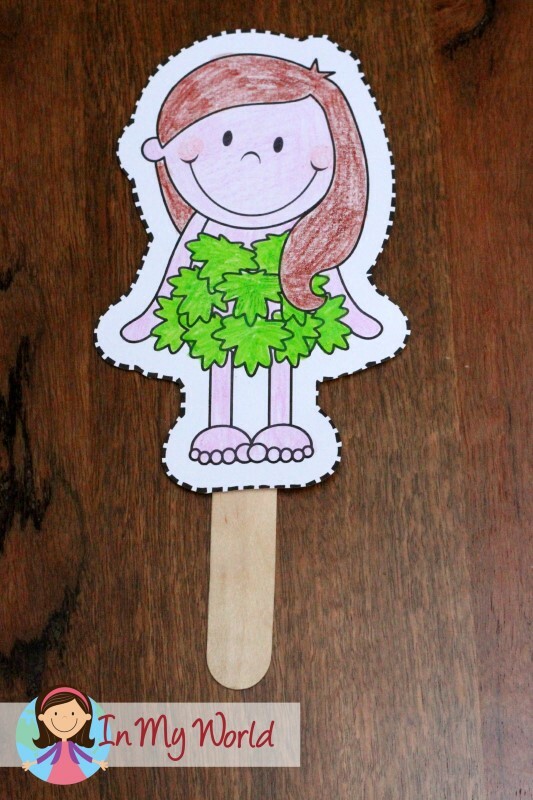 Lavina, it is a lovely idea to have the kids to do some craft for the story, it is a very helpful way to help kids to learn with fun, and it will help them memorize the story better with visual aid. Thanks for sharing — we’re having our Preschoolers do a puppet show this upcoming week and these looked great for them to use. Thank you, Lavinia, for having this for free. I love your illustrations and your crafts! This a hard lesson for 2-3 year olds. But I liked the words you chose about rules. the illustrations are great. thanks. I started teaching kids between 1.5 and 3 years old at our church since last Jan. With the age gap, it’s been challenging so I looked everywhere to find a short and interactive activities/sources so I can get their attention for minutes. I love your work and explantion how it really went with the kiddos. Thank you soso much I am bringing your Noah’s ark worksheet to kids today and so excited! Thank you, Lavinia, for sharing. God bless you. I can’t wait to share this with the children on Sunday! Thanks for the freebies! God is using you to help others in His ministry! Take care and have a super God-created day! I was trying to get your awesome Sunday school lessons to work on with my daughter just so we had some fun ways of discussing some of the stories from the bible. Especially as she preps for her first communion. But I cannot seem to download your Adam and Eve lesson. Every time I click on it it says it was put in the bin and won’t go any further…… can you help please…..